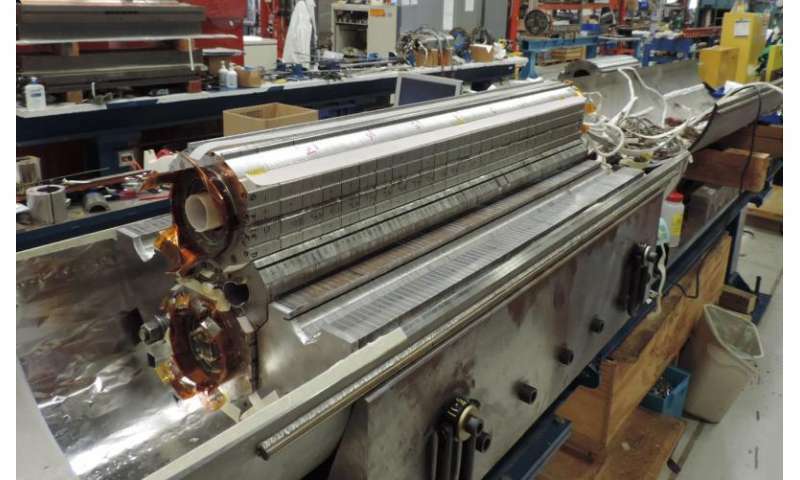 The advancements in niobium-3-tin, or Nb3Sn, magnet technology and the ongoing U.S. collaboration with CERN on the development of these and other Nb3Sn magnets are enabling the use of this innovative technology for future upgrades of the Large Hadron Collider (LHC). They may also provide the cornerstone for future circular machines of interest to the worldwide high-energy physics community. Because of the exceptional challenges—Nb3Sn is brittle and requires high-temperature processing—this important milestone was achieved at Fermilab after decades of worldwide R&D efforts both in the Nb3Sn conductor itself and in associated magnet technologies. Thanks to Nb3Sn's stronger superconducting properties, it enables magnets of larger field than any in current particle accelerators. As a comparison, the niobium-titanium dipole magnets built in the early 1980s for the Tevatron particle collider produced about 4 Tesla to bend the proton and antiproton beams around the ring. The most powerful niobium-titanium magnets used in the LHC operate at roughly 8 Tesla. The new niobium-3-tin magnet creates a significantly stronger field. In the process of upgrading the LHC and in conceiving future particle accelerators and detectors, the high-energy physics community is investing as never before in high-field magnet technologies. This creative process involves the United States, Europe, Japan and other Asian countries. The latest strategic plan for U.S. high-energy physics, the 2014 report by the Particle Physics Project Prioritization Panel, endorses continued U.S. leadership in superconducting magnet technology for future particle physics programs. The U.S. LHC Accelerator Research Program (LARP), which comprises four DOE national laboratories—Berkeley Lab, Brookhaven Lab, Fermilab and SLAC—plays a key role in this strategy.